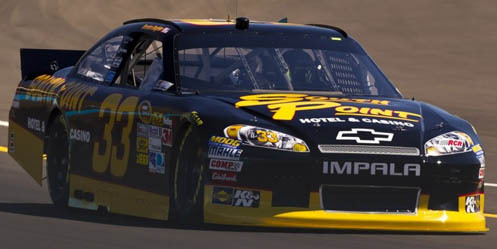 Brendan Gaughan picked up the 2nd last-place finish of his NASCAR Sprint Cup Series career in Sunday’s rain-shortened Auto Club 500 at the Auto Club Speedway of Southern California when his #33 South Point Hotel & Casino Chevrolet fell out with an engine failure after completing 1 of the race’s 129 laps. The finish was Gaughan’s first of 2012 and his first in Cup since Phoenix in the fall of 2010, when he also fell out after the opening lap while driving for TRG Motorsports. Despite resulting in owner Richard Childress’ first 43rd-place run since Jeff Burton lost his engine at Talladega in the fall of 2007, the #33 team lost five points to its competitors in the Top 35 battle and remains 35th, now just five points to the good. The team is thus locked into next week’s race at Martinsville, where Hermie Sadler will once again race at his home track. Behind Gaughan, three Cup Series last-placers in 2012 remain outside the Top 35 - Josh Wise in the #26, Michael McDowell in the #98, and J.J. Yeley in the #49 - all within 27 points of the #33. Joe Nemechek, still tied for 2nd in the all-time LASTCAR standings, suffered his first DNQ since Phoenix in the fall of 2010. Nemechek now looks towards making the show next Sunday at Martinsville, where he’s the race’s defending last-place finisher. His #87 currently stands 43rd in Owner Points, 40 points away from a guaranteed starting spot. *The #33's most recent last-place finish in a Cup race was in 2001, when Joe Nemechek’s #33 Oakwood Homes Chevrolet suffered an overheating problem after 108 laps of the Food City 500 at Bristol. The number had never before finished last in a Cup race at Fontana. Jeff Green picked up the 29th last-place finish of his NASCAR Nationwide Series career in Saturday’s Royal Purple 300 at the Auto Club Speedway of Southern California when his unsponsored #10 TriStar Motorsports Toyota fell out with a vibration after 2 of the race’s 150 laps. The finish was Green’s third of 2011 and his first since Phoenix, three races ago. With it, Green is now tied with both Joe Nemechek and Morgan Shepherd for the second-most last-place finishes in NASCAR history at 34 apiece. All three now stand one finish behind all-time leader Derrike Cope’s mark of 35. Green qualified 26th at a speed of 171.306 mph, ranking him fifth among the thirteen “go-or-go-homers” who made the field due to the race’s 43-car entry list. 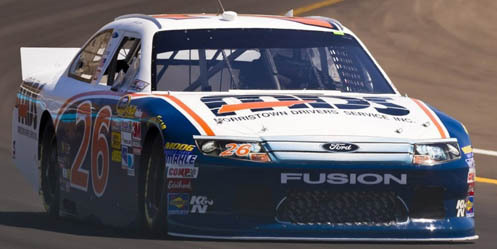 *Jeff Green’s most recent last-place finish in a Nationwide race at Fontana was in 2010, when Green’s TriStar-owned #36 fell out with a fuel pressure problem after 2 laps of the CampingWorld.com 300. *The #10 had never before finished last in a Nationwide race at Fontana. Last weekend, Riverside, California driver Josh Wise became the first driver since Dave Blaney in 2009 to finish last in both a Cup and Nationwide Series race at the same track on the same weekend. In 2009, Blaney scored both 43rd-place runs for owner Phil Parsons, driving MSRP Motorsports’ #91 Chevrolet in the Nationwide race and PRISM Motorsports’ #66 Toyota in the Cup event. Unlike Blaney, however, both of Wise’s finishes were the first he scored in either series. On Saturday, Josh Wise picked up the 1st last-place finish of his NASCAR Nationwide Series career in Saturday’s Ford EcoBoost 300 at the Bristol Motor Speedway when his unsponsored #42 The Motorsports Group Chevrolet fell out with electrical problems after completing 3 of the race’s 300 laps. The finish came in Wise’s 81st series start. Wise qualified 35th at a speed of 118.877 mph, ranking him twelfth among the sixteen “go-or-go-homers” who attempted to qualify. Having qualified behind 28th-place Jeff Green, a two-time last-placer in 2012, Wise ended up with 43rd when he followed Green to the garage after three laps. All four of the first Nationwide Series last-place finishers this season have all fallen out after completing exactly three laps. Chase Miller and Scott Speed, two of Wise’s three teammates from the Curtis Key-owned team, also exited during the first ten laps and finished 40th and 41st, respectively. Erik Darnell, in Key’s flagship #40, finished a respectable 21st. 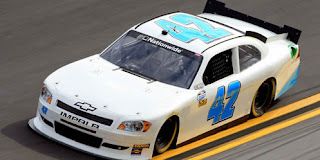 *The last time the #42 finished 43rd in a Nationwide Series race was in 2009, when Kevin Hamlin’s Smith Iron Works Dodge qualified 10th, but suffered electrical problems and did not complete a lap of the Missouri-Illinois Dodge Dealers 250 at Gateway. Car #42 had never before finished last in a Nationwide race at Bristol. The next day, Wise picked up the 1st last-place finish of his NASCAR Sprint Cup Series career in Sunday’s Food City 500 at the Bristol Motor Speedway when his #26 Morristown Drivers Service Ford fell out with a spindle problem after completing 16 of the race’s 500 laps. The finish came in Wise’s 7th series start. Wise qualified 37th at a speed of 122.380 mph, ranking him third among the “go-or-go-homers” behind David Stremme and Dave Blaney. This allowed Wise to make the third consecutive start of his rookie season after veteran Tony Raines drove his #26 during last month’s Daytona 500. However, as a result of his early exit, Wise has yet to finish under power in any of his three starts. His best Cup finish remains a 37th at Dover last fall, when he drove Larry Gunselman’s #37 MaxQ Motorsports Ford. Starting next to Wise on Sunday was Reed Sorenson, who was tabbed as a late replacement for Stacy Compton in Compton’s Turn One Motorsports team. Sorenson qualified next to Wise in 38th, securing the team its first-ever start in its first attempt. However, Sorenson also left the race early, but one lap after Wise. *This is the first time a NASCAR Sprint Cup last-place finisher fell out with spindle problems since June 8, 1967, when Wendell Scott’s unsponsored 1965 Ford fell out 51 laps into the East Tennessee 200 at the Smoky Mountain Raceway in Maryville, Tennessee. Scott was one of only 20 cars to race that day on the half-mile dirt track, and Richard Petty was the winner. *The last time the #26 finished 43rd in a Cup points race was in 2008, when Jamie McMurray’s Crown Royal Ford finished under power, but 133 laps down, in the 2008 Food City 500. To date, that is McMurray’s only last-place finish in Cup Series competition. J.J. Yeley picked up the 9th last-place finish of his NASCAR Sprint Cup Series career in Sunday’s Kobalt Tools 400 at the Las Vegas Motor Speedway when his #49 America Israel Racing Toyota fell out with an engine failure after completing 39 of the race’s 267 laps. The finish was Yeley’s first of 2012 and his first since he drove Front Row Motorsports’ #55 to a 43rd at Texas, five races ago. It was also the first last-place finish in a points race for America Israel Racing, also known as Robinson-Blakeney Racing, since its inception late last offseason. Yeley qualified 36th at a speed of 184.370 mph, ranking him third behind Trevor Bayne and Timmy Hill (making his 1st Cup Series start) among the ten “go-or-go-homers” who attempted to qualify. It was the second-consecutive start for the #49 team since an engine failure in Daytona’s Gatorade Duels left them with a last-place finish and without a starting spot in the Daytona 500. Last Sunday at Phoenix, Yeley brought the #49 home a respectable 26th, three laps down to the leaders. In Sunday’s race, Joe Nemechek’s #87 was the first car to pull out of the race during the first 20 laps, apparently set to tie Derrike Cope for the all-time LASTCAR lead of 35 total last-place finishes. However, Nemechek returned to the track thirteen laps down, and Yeley pulled out of the race shortly before Timmy Hill crashed out of the race. Nemechek moved past both Hill and Yeley before he fell out after 44 laps. *This was the first last-place finish for the #49 in a Cup Series race since 2003, when Ken Schrader’s Blair.com Dodge was involved in this horrifying single-car wreck on the eighth lap of the Pocono 500 at the Pocono Raceway. Schrader was uninjured in the accident. *The #49 had never before finished last in a Cup race at Las Vegas. 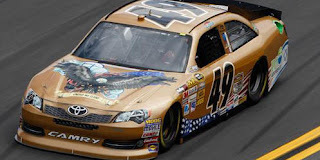 *The 39 laps Yeley completed were the most by a Cup Series last-place finisher since Dover last May, when defending LASTCAR Cup Champion Michael McDowell completed 45 laps in his #66 HP Racing LLC Toyota. Mike Harmon picked up the 12th last-place finish of his NASCAR Nationwide Series career in Saturday’s Sam’s Town 300 at the Las Vegas Motor Speedway when his #74 Koma Unwind Relaxation Drink Chevrolet fell out with a vibration after 3 of the race’s 200 laps. The finish was Harmon’s first of the year and his first in a Nationwide race since last spring at Fontana, 32 races ago. Harmon is now tied for 5th in the all-time LASTCAR Nationwide Series standings and for 11th all-time. Harmon qualified 41st in the 43-car field at an average speed of 166.420 mph. By following Scott Speed’s #47 The Motorsports Group Chevrolet to the garage after three laps, both prevented Jeff Green from scoring his third consecutive last-place finish. Green pulled out of the race one lap later, but was followed by Josh Wise, Speed’s teammate. This left Green in the 40th spot. *Harmon’s most recent Nationwide Series last-place finish at Las Vegas was in 2003, when his Gregg Mixon-owned #44 Global Industrial Contractors Chevrolet fell out with an oil pump problem after four laps. 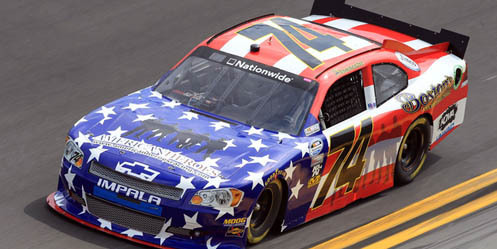 *The #74 had never before finished last in a Nationwide Series race at Las Vegas. *For the first time in Nationwide Series history, the first three last-place finishers of the season completed the same number of laps. All three last-place finishers existed after three laps, and all had “vibration” as the listed cause. 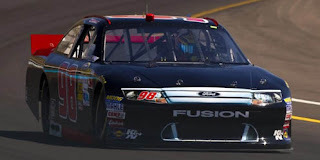 Michael McDowell picked up the 15th last-place finish of his NASCAR Sprint Cup Series career in Sunday’s Subway Fresh Fit 500 at the Phoenix International Raceway when his #98 Curb Records Ford fell out with brake problems after completing 8 of the race’s 312 laps. McDowell started 37th, fifth among the nine “go-or-go-homers” who made the field for Sunday’s race. One week after racing his way into his second Daytona 500 start, McDowell and the #98 team now stand 41st in Owner Points, seven points behind 35th-ranked Inception Motorsports and their #30 Toyota. The finish was McDowell’s first since last fall’s season finale at Homestead, two races ago, where he locked up the 2011 LASTCAR Cup Driver’s Championship. The finish moves McDowell to 7th in the LASTCAR Cup Series rankings, and to 11th all-time. In the all-time rankings, McDowell is tied with seven other drivers, including his team owner Phil Parsons. *The last time a #98 Sprint Cup car finished last in a points race was in 2004, when Larry Gunselman’s #98 Mach One Inc. Ford fell out with transmission problems 2 laps into the Sirius at the Glen at Watkins Glen International. *This was McDowell’s second last-place finish at Phoenix. 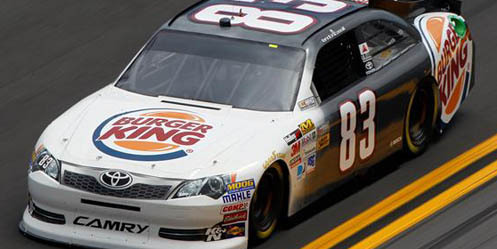 The last came in the spring of 2010, when his #66 Prism Motorsports Toyota fell out with overheating problems after completing 149 laps of the Subway Fresh Fit 600. McDowell led 4 laps in that event. Jeff Green picked up the 28th last-place finish of his NASCAR Nationwide Series career in Saturday’s Bashas’ Supermarkets 200 at the Phoenix International Raceway when his #10 Tri-Star Motorsports Toyota fell out with a vibration after completing 3 of the race’s 200 laps. Green qualified 27th with a speed of 127.977 mph, ranking him ninth among the fourteen “go-or-go-homers” who made the show. Both Green and Scott Speed retired on the same lap, followed by Chase Miller and Josh Wise, two more of Speed’s teammates from Curtis Key’s The Motorsports Group. The finish was Green’s second in a row and his eighth in the last fifteen Nationwide Series races, dating back to the start of his four-race streak at Iowa last summer. Green now holds sole possession of third in the all-time LASTCAR rankings, breaking a tie with the late J.D. McDuffie. *Jeff Green joins Phil Parsons (1999) as the only two Nationwide Series drivers to finish last at Phoenix in a #10 car. *This was Green’s second last-place finish in a Nationwide Series race at Phoenix. 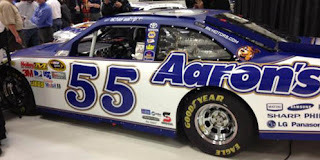 His last came in the fall of 2009, also while driving for TriStar Motorsports, in the team’s #36. AUTHOR’S NOTE: Perhaps appropriately, this website will be the final one to cover the action from the week of racing at Daytona. In the interest of providing all the statistics as quickly as possible, the articles for all six of the week’s main events are included in this article. 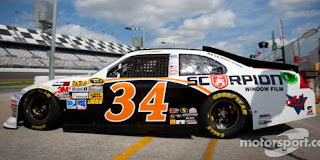 David Ragan picked up the 1st last-place finish of his NASCAR Sprint Cup Series career in Monday night’s 54th Annual Daytona 500 at the Daytona International Speedway when his #34 Scorpion Truck Bed Liners Ford was involved in a six-car pileup on Lap 2 of the 202-lap race. The finish came in Ragan’s 183rd series start. Ragan’s late involvement in the wreck - which occurred when he slammed into the disabled Chevrolet of five-time series champion Jimmie Johnson - narrowly prevented Johnson from scoring his first-ever 43rd-place finish in a NASCAR Sprint Cup points-scoring race. Johnson was scored 42nd. Kurt Busch, his #51 Chevrolet also involved in the wreck, held 43rd for much of the race before he returned to the track in the middle stages, handing the final spot to Ragan. Busch wound up 39th. *Ragan completed the fewest laps of any Daytona 500 finisher since 2002, when Tony Stewart’s #20 Home Depot Pontiac lost the engine after two laps. Harry Gant was the most recent driver to finish last in the 500 with only one lap complete, which occurred in 1978 when the engine blew on his #66 C.C.C. Buick. 1968 was the last time a Daytona 500 last-placer failed to complete a single lap, which was when Dub Simpson’s #06 1967 Dodge lost oil pressure. *This was the #34's first last-place finish since 2008, when Brian Simo’s No Fear Ford fell out with transmission problems after 20 laps of the 2008 Toyota / Save Mart 350 at the Infineon Raceway. *This is the #34's first-ever last-place finish in a Sprint Cup points race at Daytona. Jeff Green picked up the 27th last-place finish of his NASCAR Nationwide Series career in Saturday’s DRIVE4COPD 300 at the Daytona International Speedway when his #10 Tri-Star Motorsports Toyota fell out with a vibration after completing 3 of the race’s 120 laps. The finish ties Green with the late J.D. McDuffie for the third-most last-place finishes in NASCAR history (32 total finishes each). It also extended Green’s lead in the all-time Nationwide standings to three over second-place Jeff Fuller. 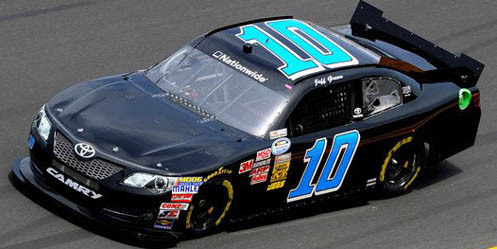 *This was the #10's first last-place finish in a Nationwide Series race since 1999, when Phil Parsons’ Alltel Chevrolet lost its engine after 139 laps of the Outback Steakhouse 200 at Phoenix. This race is better known as the scene of Jeff Gordon’s first Nationwide Series victory since his move to Cup in 1992. *This was also Green’s second-consecutive last-place finish at Daytona, joining his 43rd-place run here last July. Jason Leffler picked up the 1st last-place finish of his NASCAR Camping World Truck Series career in Friday’s NextEra Energy Resources 250 at the Daytona International Speedway when his #18 Dollar General Toyota was involved in a four-truck accident on Lap 18 of the 109-lap race. The finish came in Leffler’s 47th series start. 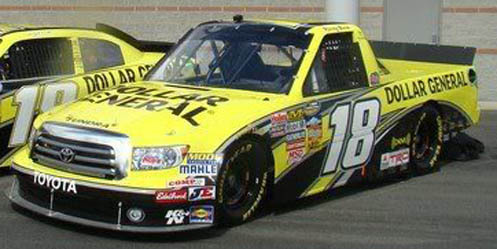 *This was the #18's first last-place finish in a Truck Series race since 1996, when David Green’s Pennzoil Chevrolet fell out with mechanical woes 7 laps into the Cummins 200 at Indianapolis Raceway Park. Landon Cassill finished last in Thursday’s First Gatorade Duel at the Daytona International Speedway when his #83 Burger King Toyota fell out with a vibration after completing 3 of the race’s 60 laps. *This was Cassill’s first-ever last-place finish in the Gatorade Duels, coming in his first-ever attempt at making the 500 field. Cassill, locked in on Owner Points, finished a respectable 22nd in the 500. *The #83 finished last in the Duels on two other occasions. The first time was in 1966 during Race 2, when Rene Charland’s 1964 Ford lost the engine after three laps. The second and most recent came in Race 1 in 1972, when Lem Blankenship’s 1972 Dodge lost its rear end without completing a lap. J.J. Yeley finished last in Thursday’s Second Gatorade Duel at the Daytona International Speedway when his #49 America Israel Racing Toyota fell out with an engine failure after completing 4 of the race’s 60 laps. *This was Yeley’s first-ever last-place finish in the Gatorade Duels. It was also the first time the #49 had finished last in either of the qualifying races. Michael Waltrip finished last in Saturday’s Budweiser Shootout at the Daytona International Speedway when his #55 Aaron’s Toyota was involved in an eight-car accident on Lap 9 of the 82-lap race. *This was Waltrip’s first-ever last-place finish in the Budweiser Shootout. Brother Darrell finished last in the 1986 running, when he was still under power at the end of the 20-lap race. *The #55 had never before finished last in the Shootout.